I-Surf is designed to enable reliable and controlled kiosk environments. This fully customisable, secure graphical user interface, is ideal for both supervised and un-supervised locations. These features make I-Surf perfect for an Internet Cafe, Library or Social Club Solution. 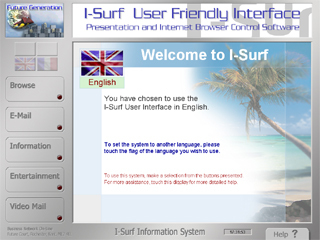 I-Surf is a fully flexible and versatile application. It is easy to customise, both in functionality and appearance.